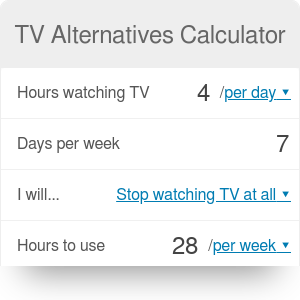 This calculator shows how you could use your TV time in a more productive way. According to statistics an average American spends nearly 5 hours every day watching TV, closely followed by Japanese, Italians, Poles, Russians and so on. As a result many of us suffer from obesity, heart diseases and many other side effects. It's comforting though that many, especially young people, start opting for other forms of spending their free time, often very active ones such as jogging, biking or even going for a walk. We definitely want more to follow as this will make our societies more fit and less prone to health problems. So here's a tool that will show you the benefits of cutting some of your TV time and spending it in some other ways. You won't regret it, guaranteed! A group of Dutch scientists ran a research which proved that biking on a regular basis makes us healthier and even prolongs our lives. We based our Bike Life Gain Calculator on their work and used exactly the same functionalities above. Based on your age and time spent biking we're able to approximately tell you how on average it should prolong your life. We assume you bike at regular speed people commute, if you're a pro and put much more effort into your rides we believe it should give you even more health benefits. running (very fast) - fast run at the speed of around 10mph (16kph). If you can keep up this pace for an hour or two - you're in a good shape! If you're not into biking or running or simply need one more activity to kill your free time, consider reading a book. At the average human pace of 200 words per minute you should be able to finish an average-sized book in roughly 5 or 6 hours. If you stick to your reading plan that could mean hundreds of fantastic books read every year. For this and other method of measuring number of books read check out also our Reading Speed Calculator. There are so many useful things you could learn in your free time. With the abundance of online courses you could learn a new skill, practice a foreign language or sign up for cooking or karate classes. Many of these things will make you a better employee, will allow you to meet new people, build great friendship and maybe impact your community in a good way. Try it out! Please note that all the results from this calculator are approximate and depend also on your individual predispositions as well as external factors. We based the results on real data, popular formulas and researches so still they make a lot of sense. TV Alternatives can be embedded on your website to enrich the content you wrote and make it easier for your visitors to understand your message.